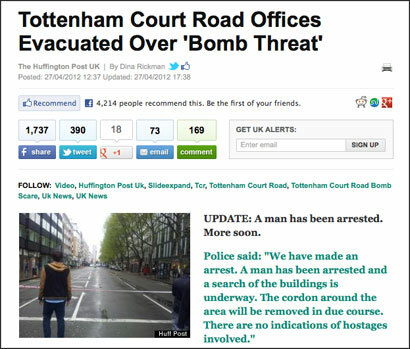 On Friday the Huffington Post UK offices were evacuated due to a three-hour siege that closed Tottenham Court Road. When journalists found themselves 100 yards from a breaking news story, they “grabbed phones, though sadly [they] didn’t grab chargers and laptops” and went into to the street, the title’s executive editor Stephen Hull told Journalism.co.uk. Hull used his iPhone to share pictures and videos from the scene, adding 5,000 followers to his Twitter account in the process. He posted videos taken on his phone on YouTube, including one of a woman called Abby who was the target of the attack. The videos went viral, receiving 32,000 and 200,000 views respectively and were picked up by mainstream TV broadcasters. One of the great things about the Huffington Post is that we can run the entire website from our bedrooms. We had staff working at home who were due to come in later in the day. They were able to pick up the running of the site and update the front page with splash images. Hull’s Storify detailing the process is available here. This entry was posted in Mobile and tagged #tcr, Huffington Post UK, Stephen Hull on April 30, 2012 by Sarah Marshall.